A federal judge tentatively overturned the conviction of a Missouri woman accused of using MySpace to deceive a teenage girl who eventually committed suicide, a U.S. attorney’s spokesman told CNN. 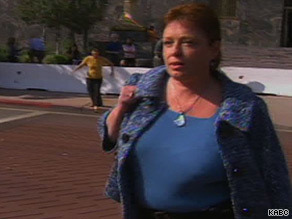 A jury convicted Lori Drew, 49, of O’Fallon, Missouri, in November on three misdemeanor counts of accessing protected computers without authorization. Prosecutors argued that Drew illegally used the social networking site to humiliate a 13-year-old girl, who authorities said killed herself after receiving derogatory messages. Drew was to be sentenced Thursday, but California U.S. District Judge George Wu — who heard the case because MySpace is based in Los Angeles — instead decided to not uphold the jury’s finding. Prosecutors based their case on a federal computer crimes statute that Wu is now challenging. Using the statute, prosecutors accused Drew of violating the social networking site’s terms of service, which prohibits creating fraudulent registration information, using accounts to obtain personal information about juvenile members and using MySpace to “harass, abuse or harm other members.” Thom Mrozek, spokesman for the U.S. attorney’s office in Los Angeles, told CNN that Wu said in court if Drew is convicted of illegally accessing computers, the guilty verdict would set a precedent and anyone who has ever violated MySpace’s terms of service could also be found guilty of a misdemeanor. “It appears that the judge is basing his decision on his conclusion that the misdemeanor statute is constitutionally vague,” Mrozek wrote in an e-mail to CNN. Wu said his decision will become final once he files a written ruling, according to Mrozek. The misdemeanor charges — which Drew is tentatively cleared of with Wu’s action — stemmed from an elaborate hoax played out on MySpace. The prosecution accused Drew of using the site to inflict emotional distress on Megan Meier. Prosecutors alleged during the trial that Drew — worried that Meier had spread malicious rumors about her daughter — used MySpace to pose as a 16-year-old boy, “Josh Evans,” who feigned romantic interest in Meier. Meier killed herself after the “boy” spurned her and at one point told her via the Internet that the world would be a better place without her, according to prosecutors. Jurors declared a mistrial on a more serious conspiracy charge. Prosecutors sought the maximum three-year sentence for Drew on the misdemeanor convictions. The U.S. Justice Department plans to explore other legal options against Drew, Mrozek said. Prosecutors might appeal the case’s dismissal and consider refilling the conspiracy charge, he said.